Missed Part 1 and Part 2? Click on the links to catch up. In Part 3 we pick up with tricks 11-15 on how to add value to your blog site. Blogging is not a waste of time. Effective blogs give their company’s website 434% more indexed pages—that’s a good thing. Get your creative juices flowing. Talk about a current event or a pop culture reference and relate it to what your company offers. Use these to illustrate a point you're trying to make or a problem your company can help with. And besides, what sounds more interesting: “5 Leadership Tips You Can Use” or “5 Leadership Tips You Can Learn from Yoda”? Short means not taking up a lot of your time, right? Yes, and the same is true for readers who don’t have much time to read super long posts. 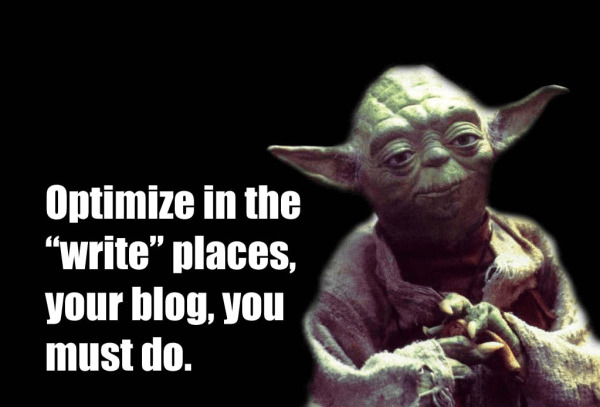 Oh yeah, and posts that are 300-600 words perform better in searches. BUT, this is only a general rule. My series of posts exceed this, but that’s because I don’t want the content to be so short that it fails to be valuable. Short and sweet is good, but don’t skimp on content. Caught on to this one? A good series will keep people coming back provided the content is all useable. Announce you’re doing a series to set an expectation. Every post should include an interesting, eye-catching photo. When you’re loading it up, make sure to tag it with keywords and give it a description using the best keywords. Go a step further. Can you convey in one picture what would’ve been a 500-word post? What about an Infographic? Readers love eye candy. Notice how Yoda works for this post? He's short. He's giving the "write" advice. He's from a popular movie series. A picture can be worth 1,000-word blog post. Can this work for your blog? Give it a try. Have questions? Let us know in the comments. You can also continue on to Part 4. Want to bring value to your social media program? Contact LyntonWeb for an evaluation of this and all your company’s other social media needs at 877-LYNTONW or info@lytonweb.com. Also, keep up to date with the latest social media and inbound marketing news by following us on our Social Media networks.